There are many untold stories in the world today. From saving lives to sacrificing your self for the greater good. Stories are past down from generation to generation and I want to make sure there is another story that is told to every programmer in the world. It is the story of those who write perfect code. An interview in Dec. 2007 was done by Charles Fishman about the programmers who code for the space shuttle. The men and women that put their code to the test. It either works and people live, or it fails and people die. There is only a good and a bad scenario. If you are space shuttle programmer, you are a perfect coder. I don't want to bore you with the forward, I would just rather get to the meat of the article. So here it is in all of its glory. "But how much work the software does is not what makes it remarkable. What makes it remarkable is how well the software works. This software never crashes. It never needs to be re-booted. This software is bug-free. It is perfect, as perfect as human beings have achieved. Consider these stats: the last three versions of the program -- each 420,000 lines long-had just one error each. The last 11 versions of this software had a total of 17 errors. Commercial programs of equivalent complexity would have 5,000 errors." That quote right there sums up coding in a basket. Write as if you had to save a life - Its amazing what someone would do to know that their code could end up costing lives. Learn something from this article and bring it back to your company. In the end, its the process by which they executed that makes their code perfect. Learn to make great code, plan and think about great code. The average programmer today thinks 80% of the time and actually codes only 20% of the time. This thinking is what makes the programmer better at writing clear and concise code. This story should be placed in a book for all to see and remember. Its an inspiring piece about the perfect programmers. Now the question remains: Have you ever created something flawless? Why get bored, when you could be coding! There are many times in life when you have nothing to do. As a member of the civilized world, we as a people are becoming bored every day. We are a world that watches more movies everyday. I bet if the movie industry came out, we would see the statistics of movie goers have increased over the last 20 years. We are a world that technology has allowed to do many things that have taken us hours or even days to do before. Our world is speeding up and everyone wants more. They want to get done faster, finish things better and move on to the next project. People get bored easily these days because production levels have gone through the roof with the help of technology which allows us to become lazier. Life in it self is full of its bored moments. People in general have less and less to do because technology has sped up our daily tasks. I think that is one reason why more and more movies are being watched. People want more out of life and movies give you that little action and adventure that your looking for. Movies give you the ability to stop boredom. To some people, movies are a way of life. My life is no different, technology has made my life so much easier than people that have come before me. My solution of boredom? People need to find a hobby. They need to find something that will keep their attention. If they don't they will inevitably become a YouTuber. YouTuber -A person that watches excessive amounts of YouTube to pass the time. Not only applied to YouTube, but a person that does an excessive amount of anything to which they do just to pass the time. This isn't a hobby, but a time waster. People that watch and enjoy YouTube to me are either doing it because that is their hobby or they are doing it to pass the time. I personally code as my hobby or down time. I not only do it as a hobby, but to make my life and everyone else's life a bit easier and a bit better. I am like every other programmer or hacker the does it. I chip away at making life better. I don't think I will ever be as rich as Bill Gates, but I hope to have helped as many people in my life as he has. This is where coding/hacking comes in. When I get bored I code; when I want to do something, I code. Due to technology, I get to do a lot of my hobby. If this is your first time reading, then you wouldn't know that I usually try to have around 2-4 projects going on at once. My projects are all for making life a bit easier for me and everyone that has access to a computer and internet. I have about 15 ideas that could be implemented currently and boredom brings my code to life. Like I said before, I don't get bored, I code. Right now I am even sitting with friends and watching some football. I can keep a conversation, watch football and blog all at once. When I get bored, I code (so I am not coding, but being productive). The point I was trying to get across: Stop being bored, be productive. Find a hobby, find something. Carpe Diem (Seize the day). Learn something, do something and retain it. When I get bored, I code. Life is not about being bored. Life is about doing something. Its about achieving something better than your self. My something better right now in my life is coding and my great girlfriend. In a world of Microsoft and third party applications, out comes t4. t4 is a code generation tool that can compete with CodeSmith, but its FREE and built right into Visual Studio. It has been years since the first edition with very little publication of the actual application. t4 is a free code generation engine from Microsoft that underpins the Domain Specific Languages and Software Factory toolkits. t4 is a rich code generation and has the ability to stand up against and compete with CodeSmith. I have used both Codesmith and MyGeneration a lot in the past few years, so I have seen the competition. What is nice about this old/non publicized tool is that it is built directly into Visual Studio 2008.
t4 is being spear headed into the open source market for free templates by Oleg Sych. It brings a long a toolbox which can also be download with extra templates along with a GREAT T4 Editor which of course is also free. There is not more need to spend money on CodeSmith, when Microsoft will do it right out of the box with Visual Studio. Some have speculated, why hasn't Microsoft published this tool to a greater extent. We can only think that it has to do with being a Gold Partner. Microsoft doesn't like to lose Gold Partners and therefore hasn't truly publicized this tool. The next question you have to ask your self is what can be generated? As of October 2008, t4 Editor has been officially placed as a plug in to Visual Studio 2010, which will boost the ability to generate t4 code through other means besides CodeSmith. Demos and Other information can be found below. Oleg Sych - t4 evangelist. Point of concern: If your company currently uses CodeSmith, wouldn't it be nice to tell your boss what you found could save the company a few hundred dollars by using something that is already built into Visual Studio? So why not give it a try and save a little money doing it? First off, I want to clearly state that BlogEngine.Net is the best piece of blogging software I have seen since Live Writer for Windows. I support this Blog provider and I have found this platform incredibly resourceful and worth its weight in gold. The community is vast and still growing along the way. I am increasingly proud of Mads and his team for what they have done with ASP.NET and BlogEngine. But, the last update was in August 2009 and it is now November. The dotnetblogengine.net hasn't been uploaded since September and the current road map goes no where. No specified date attached with the road map. I personally think there still is need for a bit more work to fully compare this blog with Wordpress or blogger.com. It currently doesn't support multiple blogs, email to blog, and text message to blog (lifestreaming idea) in which all of its current competitors are either there or surpassed what I just stated. The question is, has the development moved slowly for BE or is it currently being taken over by more important projects? I would at least like to see an updated road map that defines the goals for BE. Mads, if your reading this could you give us an update on the status of BE and where the development for it is going? Have you ever reached the pinnacle of the programmers peak when working on a piece of code while drunk? Have you ever thought: now that's a brilliant piece of code, what the hell did I do last night? From time to time, all programmers will eventually experience the peak. 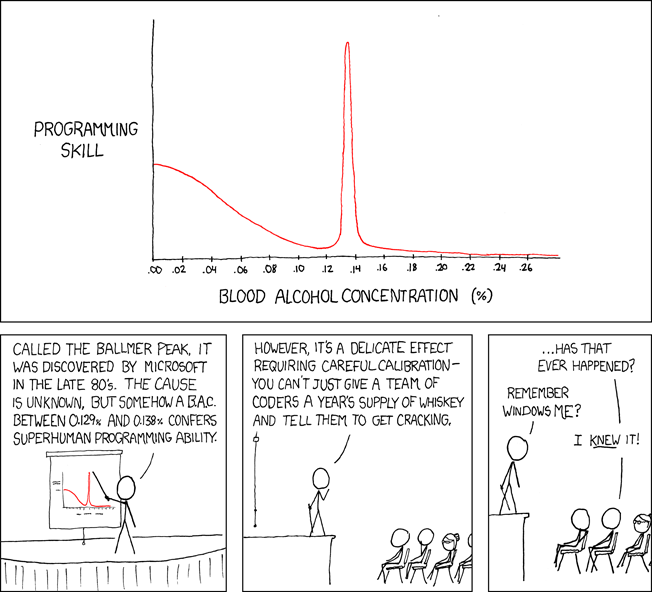 Its called the "Ballmer Peak". Its the moment that your a few beers in with the Blood Alcohol level of .13%-.14% where you just start to write the magical code. Its the theory that computer programmers can obtain a superhuman coding ability with the blood alcohol level between .129% and .138%. It was discovered with Steve Ballmer and coined at the web comic XKCD. The theory came about referencing Steve Ballmer and his crazy acting pretty much what looks like a drunk when ever he is on stage. The theory though is more than what meets the eye. It might actually be somewhat correct in assumption. Have you ever had those nights where you just hacking away at code while having a few beers and you wrote brilliantly? Only to wake up the next morning not able to compile the code you wrote! I have been there many a times and put this theory to the test. Point of concern that throws this whole theory out the window is that Steve Ballmer never wrote any production code while at Microsoft. He has a background in business and is known for being able to solve difficult math calculations mentally, but not code. This is one of those theories I don't mind trying over and over again. Someone needs to take the initiative and insert it into Wikipedia. 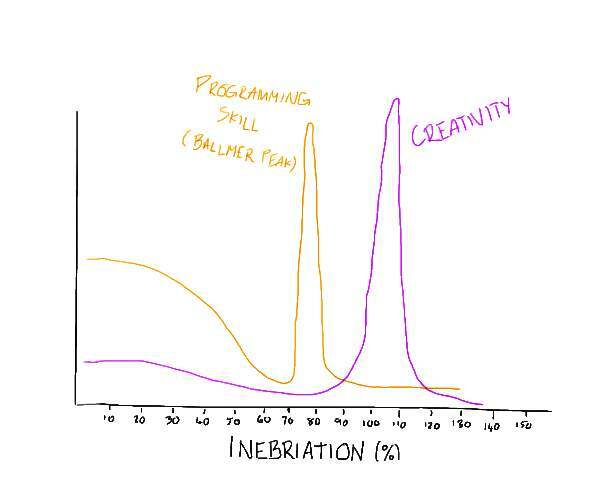 Programmer's Paradox, which is the lag in creativity behind skill on the inebriation scale.